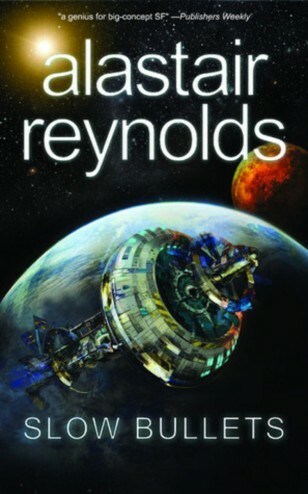 Slow Bullets is, I’m embarrassed to admit, my first exposure to Alastair Reynolds’ writing. Based on what I’ve heard of Mr. Reynolds’ works, I expected a story that would put a premium on the details of a hard science fiction environment. Instead, I was treated to a war story that is too complex for the all-encompassing label of space opera. I suspect a reader will see my invocation of the words “war story” and “space opera” as an invitation to view Slow Bullets as military science fiction. Indeed, I thought about applying that label, myself. However, it feels like doing so runs the risk of minimizing the nuance at hand within this short book. Mr. Reynolds has written what I’m going to call a “peace story”. Though he borrows from elements of about half dozen tropes and sub-genres, their coalescence is something delightfully fresh. Slow Bullets is told through the memoir of an ex-solider called Scur. The voice and tone are well suited to the nature of the story, inviting a measure of intimacy between narrator and reader. Scur’s narrative begins on the eve of a cease fire between an interstellar human hegemony divided against itself. The details of the war, such as why it happened, are left intentionally vague – save for the occasional nod toward a religious fuel fanning the flames of war. I suspect this is both an intentional allegory to contemporary times, and also a means of accentuating the grand pointlessness of armed struggle i.e. all fighting is arbitrary to the outsider. In the opening pages, readers witness Scur’s capture and torture before she wakes up in a cryopod aboard a prison transport. The balance of the story brings together the narrative threads of a space ark, interstellar disaster (with just a soupcon of cosmic horror), and the survivor’s tale. The first half of the book, which concerns itself with how people of disparate ideologies forge an uneasy peace despite being centuries removed from their own time via an FTL accident, is considerably less interesting than what I see as the novel’s central question: who are we without our culture? Mr. Reynolds uses Scur and her shipmates to explore questions of identity and shared history. 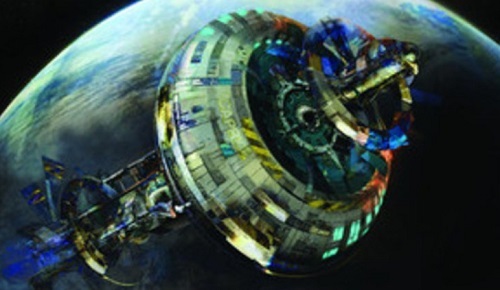 In the wake of a cosmic disaster, Scur’s ship is more than a lifeboat for the survivors; it is a cultural ark for the collective knowledge of humanity. The novel posits that with a single shove from an external force, the culture and wisdom of the ages can be lost. Civilization, even among space faring peoples, is a fragile thing. Staring at the pieces of a broken world, Scur and her shipmates are forced to ask themselves if their individual identity is worth more than the identity of the species. It is hard not to look at that question and reflect upon it outside of a science fiction context. Replace the cosmic horror with something much more pedestrian, like ocean acidification or a solar flare, and ponder how much our own national identities or religious affiliations should mean to us. How much of ourselves would we be willing to sacrifice to protect the greater whole of humanity? Would a Christian devote their life to protecting the last copy of the Quran? Would a Marxist give over part of themselves to the collected works of John Maynard Keynes? These are the sort of questions at the core of Slow Bullets. And if I have a single criticism of the novella, it’s that we only see these questions come to forefront late in the story. This isn’t to suggest that the first half of the novel is unsatisfying. One should not jump into an existential crisis without allowing a reader time to make the allegorical connections between their world and the fictional one. At the same time, I wanted more of this crisis once it was recognized. I expect this desire for more should suffice as a ringing endorsement of Slow Bullets. Military science fiction almost always asks its readers to examine solders giving up their lives for the greater whole. It can show the absurdity of conflict, or reinforce the notion that the cost of freedom is vigilance eternal. Mr. Reynolds uses Slow Bullets to take the traditional war story in a different direction, asking its soldiers, even in peace, to continue sacrificing their individuality for a greater whole. While it might be somewhat self-serving of an author to suggest that poetry and art is worthy of an individual sacrifice, this critic sees no reason to disagree. If the transcendent isn’t worth protecting, then what is the purpose of anything? A person would do well to keep this question in mind as they read Slow Bullets. @AdamShaftoe @AquilaRift -WOW- not an easy book subject to tackle. on the list definitely.